Booker D. Surfdog and Onyx Shorepound Surfdog drew a crowd after catching some waves during Margate's 'Beach Stock' on Saturday, June 24, 2017. The pooches are in the area all summer to surf with autistic children through the 'Heart of Surfing' program. In this age of perpetual angst, we all need a feel-good story to take our minds to their happy places every once in a while. Among those feel-good stories, I defy you to find one that makes you feel better than watching dogs on surfboards, especially when they're bringing joy to autistic children. That’s exactly what's happening this summer at the 57th Street Beach in Ocean City courtesy of a visit from Booker D. Surfdog and Onyx Shorepound Surfdog. For the local stops on their “2017 Old Dogs & New Tricks Surf Tour” – and a residency of sorts that will run through September – the surfing pooches teamed up with the good people at Heart of Surfing. That non-profit organization provides free surfing and skateboarding lessons – along with providing other means of support – for families with children with autism and/or special needs. While conditions in the morning forced the cancellation of Saturday's dogs-and-kids-surf-together expedition, the pooches entertained the crowd at Margate's Beach Stock in the afternoon on their own. The “joyride for special needs kids” started in 2014 as a surfing program but expanded well beyond that in the time since. It was the brainchild of Bob and Cindy Fertsch, who saw the benefits their autistic son Jamie drew from surfing waves with his dad. “Why can’t we do this here?” Cindy recalls the couple asked aloud. And start it up, they did. The June 17 event kicked off their summer season, and its special-needs round in the contest has been embraced for inclusion at all local surfing competitions throughout the year. 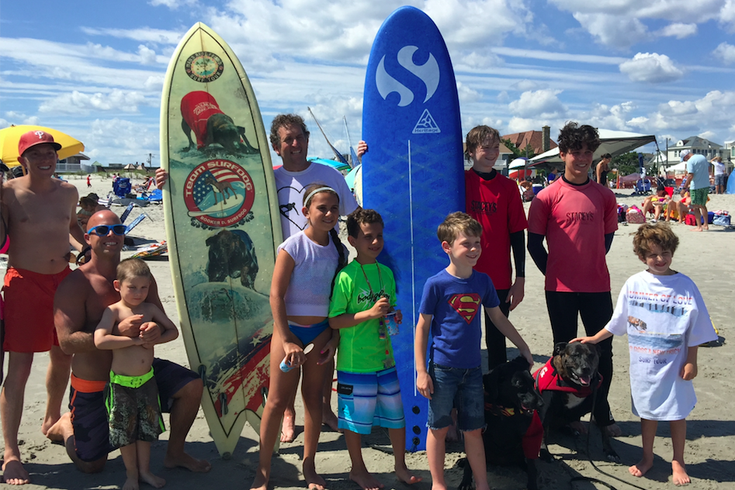 Two weeks back, Onyx made an appearance at International Surf Day festivities and the Heart of Surfing held a surf contest including special-needs surfers on the 57th Street Beach. Adam “Pops” Steinberg is Booker D. Surfdog’s trainer and friend. Upon arriving in South Jersey from Florida with the 13-year-old brindle pit-bull mix last week, he spoke about he and the pooch’s motivation for being involved in such events. Heart of Surfing helps anyone on the autism spectrum, from light to heavy, he said. But, most – if not all – react positively to having interactions with surfing dogs. “Somehow, interactions with dogs acts like a trigger pressure-release valve,” he said. “It’s a common cliché that dogs offer unconditional love, always running to you when you walk in the door. "Well, kids are extremely sensitive to those vibrations, and very sensitive to those subtle interactions while we – in our good-time, rock-and-roll, daily lives might overlook it. Cindy noted that, over the years, people are seeing more and more of how dogs help with the healing process. When her mother recently was in the hospital, the only time she smiled was when a therapy dog came into the room. The awesomeness of the events aside (the Margate exhibition, as evidenced by the video above, drew quite a bit of attention on the packed beach), equally awesome is the existence of surfing dogs in the first place. “Dogs don’t start surfing right away. They have to be taught. There’s anxiety if the dog doesn’t know what to do. A trusting relationship in the formative part of learning is important. “Practice, practice, practice. You can start in a swimming pool, or at a lake. You don’t have to live near an ocean to teach your dog how to surf. (The chance of success comes) once you build that relationship, and are confident enough that it learned the lessons. “With Booker D. Surfdog, there’s not a board or a wave that she can’t ride now. She can do anything on a surfboard at anytime. But, she’s been doing it for 13 years now. For a dog to work through the anxiety to be truly comfortable on a surfboard, and won’t freak out at big waves or big crowds that would normally distract a dog, it can take four years. When Booker comes out now, she won’t be distracted by anything. If you want to see the kids and dogs surfing together this summer, they'll be out at the 57th Street Beach in Ocean City each Saturday at 9:00 a.m., weather and conditions permitting.